2016 Alfaro Family Vineyards, Rose of Pinot Noir, Santa Cruz Mountains. 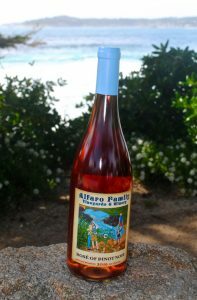 One of the very best Rose wines of the vintage so far is Richard Alfaro’s dry and full flavored Rose of Pinot Noir 2016, this year’s pink from Alfaro Family Vineyards is a thrill ride of juicy Jolly Rancher watermelon, distilled strawberry, raspberry/peach and tart cherry along with a burst of red citrus and steely mineral tones. This salmon/electric pink Rose lingers with rosewater, wet stones and hints of spice, it was fermented in stainless steel and then aged for about 3 months in well seasoned French oak before being bottled. This zesty fresh Rose is vibrant and vivid, but still ripe and textured, it comes in at 13% and certainly has a presence on the palate making almost it irresistible and excitingly pleasing as a summer sipper, great with or without food. Alfaro makes some of the best wines for the money in California specializing in Pinot Noir and Chardonnay from his own estate and the Trout Gulch Vineyard, which has gained an almost cult like following with wineries like Cerritas, Arnot-Roberts and Kutch buying fruit from this site near Aptos, but don’t miss Alfaro’s Albarino, Gruner Veltliner, Syrah and in particular this awesome Rose of Pinot Noir! You should check out these wines and visit the winery in the hills near Corralitos in the south side of the Santa Cruz Mountains a stones throw from the Monterey Bay, plus their wine club rates right up there with Ridge in offering top value, quality and variety.